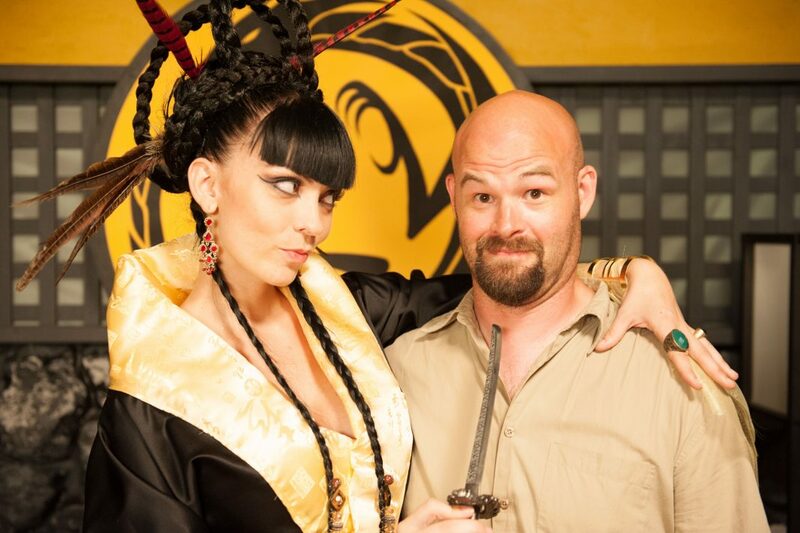 Large has fun with his cast including the star of Episode III, "Ganamazol's Gambit," Elle Viane Sonnet. Photo credit: Damian Vines Photography. 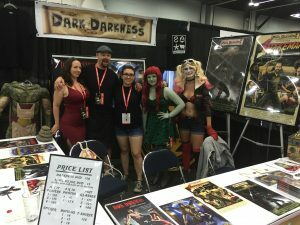 Whatcom County professional filmmaker Wilson Large is moving forward on the next phase of the successful locally-produced and directed adventure-comedy-fantasy web series, Dark Darkness. With four episodes of Season Zero under his belt, now touring at festivals and winning awards, Large is motivated by the support of local businesses and artists to begin pre-production on Seasons One and Two. He plans to expand both scale and budget while continuing to keep it local. Snakeman of Episode IV “Snakeman’s Solitude” is played by Jordan Donovan. Photo credit: Damian Vines Photography. Dark Darkness was first inspired by a 2007 serial play by Ben Eisner at Bellingham’s Idiom Theatre (now part of the new Sylvia Center for the Arts). The story is both an odyssey and an homage inspired by some of the best science fiction/fantasy comic books, board and video games, and films. “I call it Saturday morning cartoons for the YouTube generation,” explains Large of Season Zero. The web series follows four flawed but powerful “Dark Lords” who must become reluctant allies as they solve a mystery that will clear their names of a murder they didn’t commit. They must ultimately learn how to be friends in order to survive. “The underlying message is that even Dark Lords can be compelled to do positive things,” adds Large. Large had been immersed in Bellingham’s filmmaking community since before 1998 when he bought the Bellingham video production company, Camcord and Company, which he changed to Camcord at Large. The director, cast and crew are constantly in action on the set. They are seen here filming Episode III “Ganamazol’s Gambit.” Photo credit: Damian Vines Photography. In 2011, Large changed the name of his company to Current Media Productions and sold it to local filmmaker Jordan Donovan, who owns and operates it today. Over time, Donovan and Large became close friends. Large continued to make commercials and training videos via his company, One World Productions, all the while writing and developing Dark Darkness and his team of local film artists. The first episode of Large’s passion project, Season Zero’s “Ronald’s Summoning,” debuted in mid-2012. 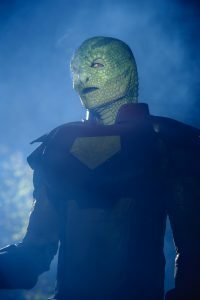 Episodes II and III came out in 2014 and 2015 and eventually Donovan was cast as Snakeman in Season Zero’s Episode IV “Snakeman’s Solitude,” which appeared in January 2016. Wilson Large attended Rose City Comic-Con in Portland, Oregon with (Cat Lady) Brandi Sheppard, Large, (Stanzi) Collene Ames, Makeup Assistant Izabella Kornelis, and a friend. Photo courtesy: Wilson Large. Large was confident taking the project outside Whatcom County because of the tremendous support the project has received within it. His local productions spanned the past four years and have involved more than 90 Washington State artists, most residing in the Bellingham area. The project also has included the skills of connected and incredibly experienced Los Angeles filmmakers who have retired to Whatcom County or who commute back and forth including CSI: NY’s Jesse Collver, set designer Mel Cooper, and production designer Garvin Eddy. Large has fun with his cast including the star of Episode III, “Ganamazol’s Gambit,” Elle Viane Sonnet. Photo credit: Damian Vines Photography. “We’ve also secured Mel Damski as the director of either future episodes or a full-length feature,” adds Large. Damski lives in Bellingham and is known for his work directing dozens of movies and hundreds of hours of series television including M*A*S*H (1972), Boston Legal (2004), Psych (2006), and Scorpion (2014). More than 30 local businesses have also backed the project as sponsors and in-kind donors since 2012. Boundary Bay Brewery and Bistro, Bellingham FrameWorks, and Attorney Andrew Subin are just a few of the long-time business supporters. Several of the principal cast and crew are shareholders in the new venture with 33% still available to outside investment. Large continues to work as a commercial producer and editor via his company One World Productions. Dark Darkness is also expanding to include much more than a film. “It’s such a big universe,” notes Large. “We’re in talks and developing spin-off web series, a board game, comics, and books. It’s turning into an intellectual-property, trans-media franchise. It’s very exciting for us.” The board game is being developed by Dark Darkness creator Ben Eisner with his brother Tim by their Portland-based company, Weird City Games.